North Korea has announced that past inter-Korean nuclear disarmament statements are now void, even as the country battles fresh sanctions imposed by the United Nations Security Council (UNSC). The UN Security Council vote imposed more sanctions on the country for its third nuclear test. North Korean authorities have cancelled a hotline and a non-aggression pact with South Korea, and in a statement issued on Friday they said they would retaliate with “crushing strikes” if enemies intruded into its territory. “The DPRK abrogates all agreements on non-aggressions reached between the North and the South,” the country’s Committee for the Peaceful Reunification of Korea (CPRK) said in a statement carried by the official news agency KCNA. “The DPRK will close the Panmunjom liaison channel between the North and the South,” it added. 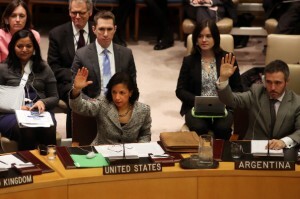 The 15 nation UNSC council, which includes China, had unanimously approved the US-drafted statement. Thursday’s Security Council resolution will tighten financial restrictions on North Korea and crack down on its attempts to ship and receive banned cargo in breach of UN sanctions. North Korea has accused the US of using military drills in South Korea as a launch pad for a nuclear war and has cancelled a hotline with the US and the armistice that closed the Korean War in 1953.